Make a simple electromagnet by coiling wire around a nail. It can pick up several paperclips and small nails. Use the sandpaper to remove the plastic coating from about 1cm of each end of the wire (do this ahead of time for younger students). You will see the silvery-copper wire colour underneath. Starting at the head of the nail, leave about 7cm wire sticking out, then wind the wire around it in tight turns. Move slowly down the nail, until all but the last 7cm is coiled - it will make about 80 turns. It does not matter if the coils lie on top of each other, though the tighter they are packed together the better. Keep the coils pushed towards the head of the nail so that when winding is done, the pointed end of the nail is still exposed. Secure the coil onto the nail with pieces of masking tape. (Skip the tape if galvanized nails are used, as the coils stay tight on the rough nail surface). Make sure that there is about 7cm straight wire sticking out at each end of the coil. Fold over each end of the sandpapered wire ends so that the pointy end is tucked away. Fold a small piece of aluminum foil around the ends of the wire to cover the ends. The foil will help to make the connection between the copper wire and the battery. Hold the foil-coated wire ends over the ends of the battery to make electricity flow through the coil, then touch the pointed tip of the electromagnet against smaller nails and paper clips. Note that the battery becomes hot if it remains connected for a while so make sure it is disconnected frequently. 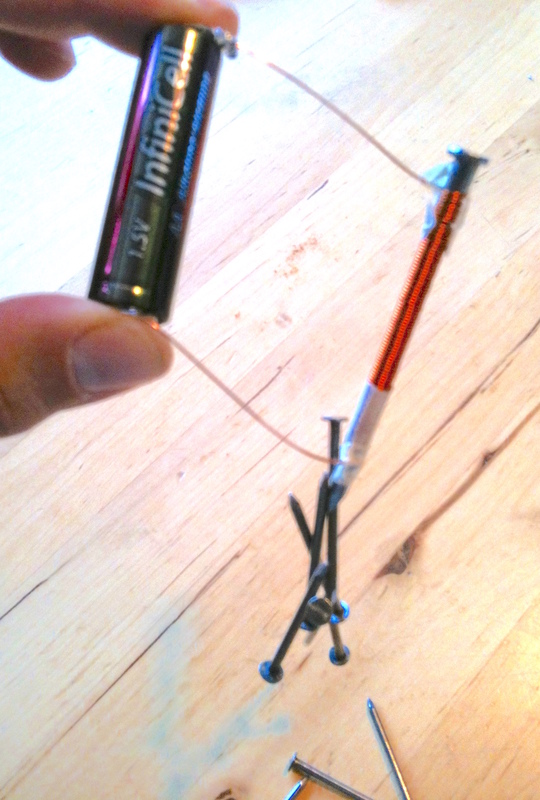 This activity drains batteries very fast (there is not much resistance in the wire). When there is electricity from the battery flowing through the copper wire, the coils make a magnetic field, which is significant with the many turns. This magnetic field turns the large nail into a magnet, strong enough to pick up small nails, paperclips etc. 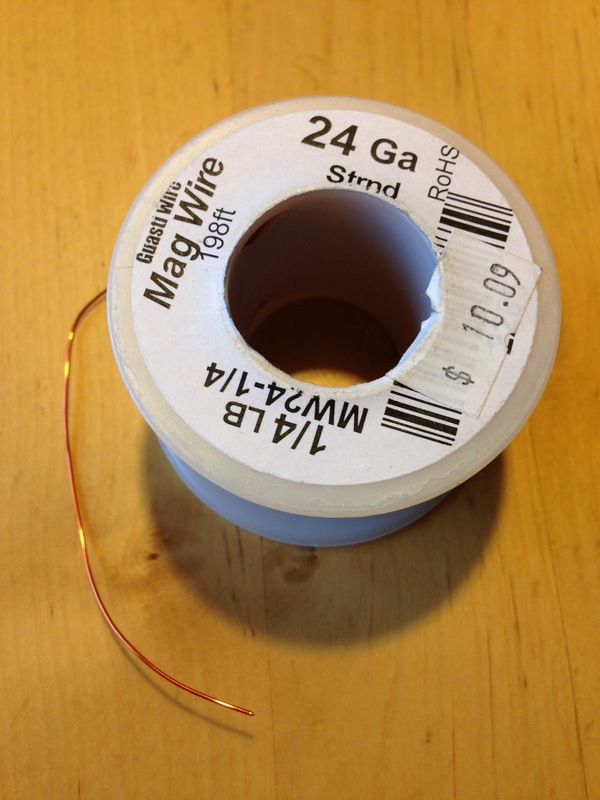 1/4lb of 24 gauge mag wire (also called hookup wire) is 198ft and costs about $10. 198ft makes 46 electromagnets. For younger students, they made one electromagnet in pairs, and I had pre-made electromagnets to distribute so that they could all try one. Using a galvanized nail means the tape can be skipped, as the rough surface makes the wire grip on its own. Don't make the wire any shorter for younger students. A shorter wire has less resistance than a longer wire and will pass more current and so heat up more quickly. A shorter wire gets quite warm quite fast.